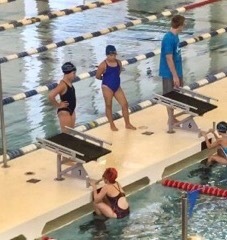 Jordyn with the red cap before starting backstroke. Some of you may have seen that my granddaughter, Jordyn, at age nine, tried out for swimteam and made it. I was a swimmer for most of my youth, swimming on summer and winter teams in the Chicagoland area. I was actually shocked when Jo made the team. She could swim but wow, to get in and compete against kids who had been doing this for a few years already, is hard. First meet, Jordyn did not have a quality dive or a good turn but she got in and won a second place and some other ribbons. Excellent start. Her coach clearly believes in her and pushed into the relay space (filling in for an absent swimmer) at this last meet. Oh, goodness, barely a dive and now has to wait for the other swimmer to touch and dive off into the pool to swim the relay race. She was worried sick and having a panic attack but she listened to her coach and focused on what to do. Guess what, the relay won first place!! Jordyn ended up with three firsts (swimming freestyle in two relays and 50 yard free) and a second place for the day! I can’t help but think where she will be when that dive becomes routine and those turns are flip turns. Wow, this lean, tall girl is going to be (or has become) a swimmer! I love Seth Godin on any day but this blog about relays was certainly appropriate for me (and Jordyn). I hope you enjoy it too! It’s well known that the team that wins an Olympic relay isn’t the fastest at running or swimming—it’s the team that handles the handoffs the best. The same thing is true of your job. The tasks could be done by many people, but someone who is great at your job embraces the mental effort necessary to do task switching, to read between the lines, to keep many balls going at the same time. Strategy and tactics both. Sometimes, we think that these are the things that get in the way of our work. In fact, they are the work. Writing a sentence is easy. Deciding what to write in the next sentence is hard. It turns out that the mental load of management is primarily around experiencing failure. Actual failure, sure, but mostly potential failure. Imagining failure in advance. All the current things that could go wrong. And more important, the things you’re not doing that will be obvious oversights later. Our brains work overtime to cycle through these, to learn to see around corners, to have the guts to delegate without doing the work ourselves (even though that creates more imagined points of failure). Scan, touch, consider, analyze, repeat. The other thing that’s a huge load: Worry. Unlike all the things I’ve already mentioned, worry isn’t actually part of your job. Worry (expressed through non-productive pessimistic cycles over things out of your control) is antithetical to the work you’ve agreed to do. Clear your cache of worry. It’ll free up your processor to focus on the useful stuff. This entry was posted in Family Life, Grandkids and tagged making the team, relay, seth godin, swimming, swimteam by Exechorseluver. Bookmark the permalink. Thanks for the sentiment to “clear your cache of worry! I needed to hear that today! And way to go Jordan!